Before I explain, I must first ask: any Grey’s Anatomy fans out there? So I’m sitting here listening to my Pandora’s Norah Jones station, with a bit of writers block as to what I can write. Not what to write (since the last month has surely brought about many normal wavelength peak and trough events, and many good meals), but what I can write without getting myself in a whole taco-added-combo-pack of trouble. This is the World Wide Web, after all. Then, Anna Nalick’s song, “Breathe” came on the virtual radio. Remember that Grey’s scene– where Meredith has her hand inside a body cavity with a living bomb and it’s literally in her hands to lift it out and give it to the bomb squad? (Trust me, it was a good one!) Well, surprisingly enough, the only person who dies is the mean bomb squad guy, and the episode ends with Meredith and McDreamy recounting their last kiss, and the lavender smell of her hair. It was adequately mundane following a nail-biting brouhaha. I’m about at the stage of taking the time to remember the lavender smell, after the craziness. To trace the pattern in a doily after coffee has spilled on it. To close my eyes and watch the sparkly pattern of excess light make strange shapes on my eyelids. Too artsy-fartsy? Ok, then just to breathe. With an effort to create a better balancing act, I have been trying to take some time to just breathe a bit. But in my just-breathing, the provisions that every household needs have either 1) caused me to go to Walmart at an ungodly time wearing a winter coat and Ugg boots over sweatpants hoping no former students, nor parents, nor co-workers, nor anyone with eyes, will see me, OR 2) forgotten about all together. For example: we have no eggs, and haven’t for days (this is a big deal considering we go through about two dozen a week). I did the oh-so-frowned-upon-request of asking Rob to pick up girly firming lotion on his way home yesterday. And finally, I went to get dressed today and remembered I have no deodorant. Not even the half-used little travel sized that gets stuffed in the back of the cabinet. Now I know we live on the Oregon Coast and all, but I don’t think I could take my natural ways that far. So, in our haste of life, combined with the effort to reduce the haste of life, the result is that I smell like a man today – Old Spice, “Swagger” to be exact. So what does this call for? More coffee – absolutely. But something we can all enjoy? A recipe! 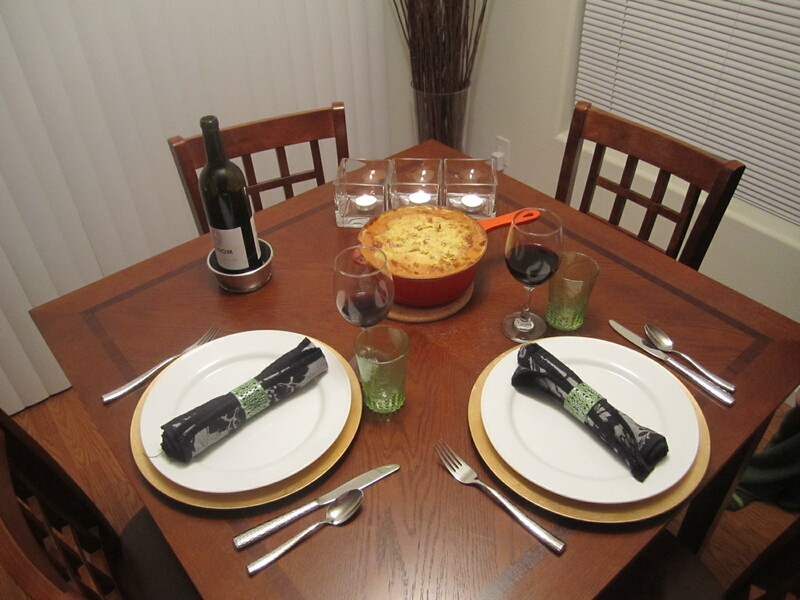 Last week, Rob and I took some time to try and slow down a bit an enjoy one of his favorite meals: Shepherd’s Pie. 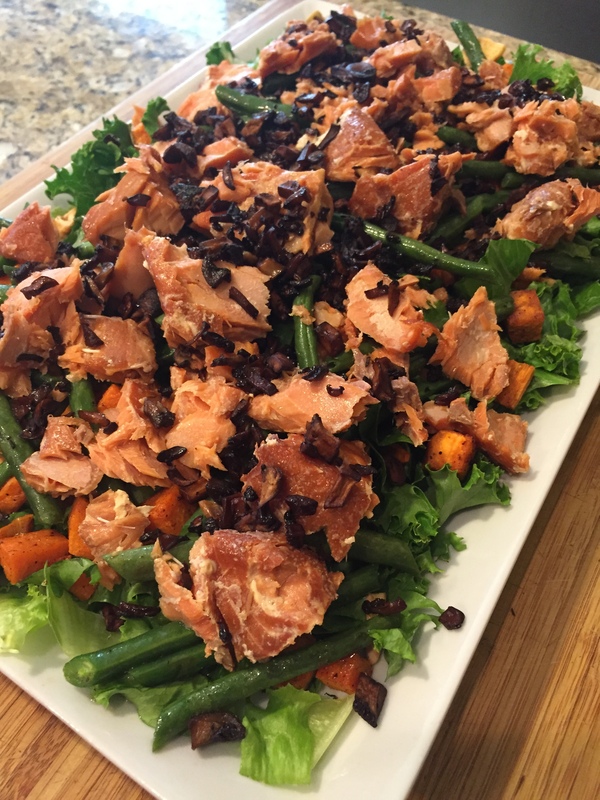 Lift your chin off the table – I know I don’t tend to cook many meat-and-potatoes meals. 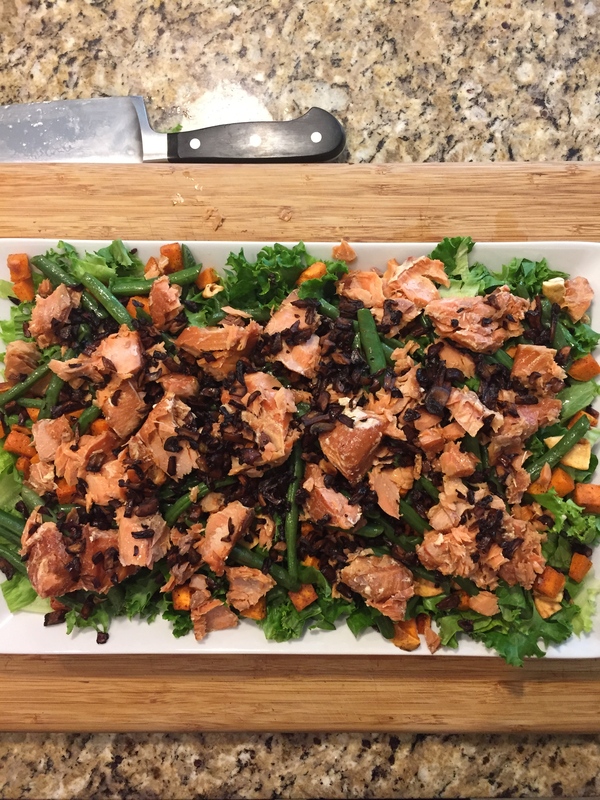 There was no quinoa, there was no soy, and there were definitely more than just a few ingredients. But the result was absolutely amazing. I even had seconds. While our first choice was to use ground lamb, it was unavailable at our butcher, so we went with the next best thing (in Rob’s eyes), ground beef. Actually, he did a great job finding a 90-10 organic local Oregon brand, which made me feel a bit better about scarfing down the beef. It happened to be a cold and rainy night (imagine! ), so the meal hit even another nerve of comfort. 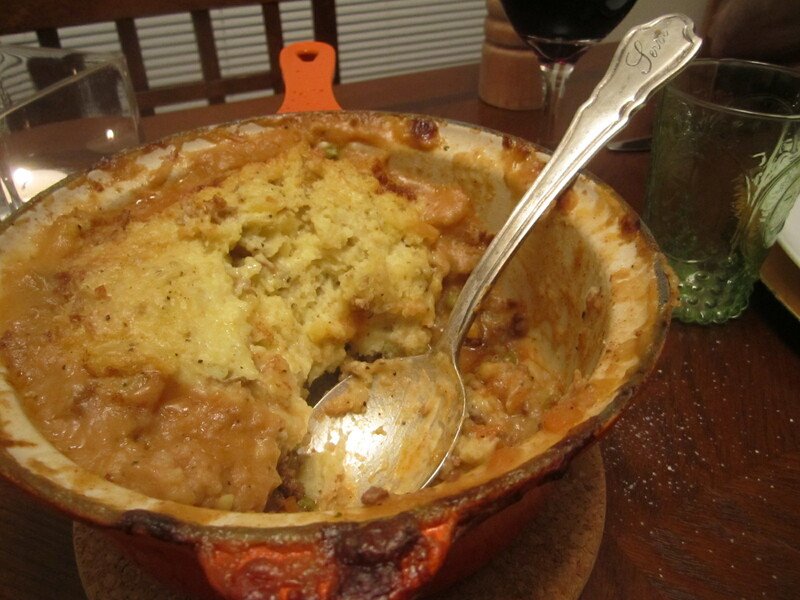 I used a version of my mother-in-law’s recipe for mashed potatoes, and baked that pot of tasty meat and carbs until it was thick, rich, and browned. 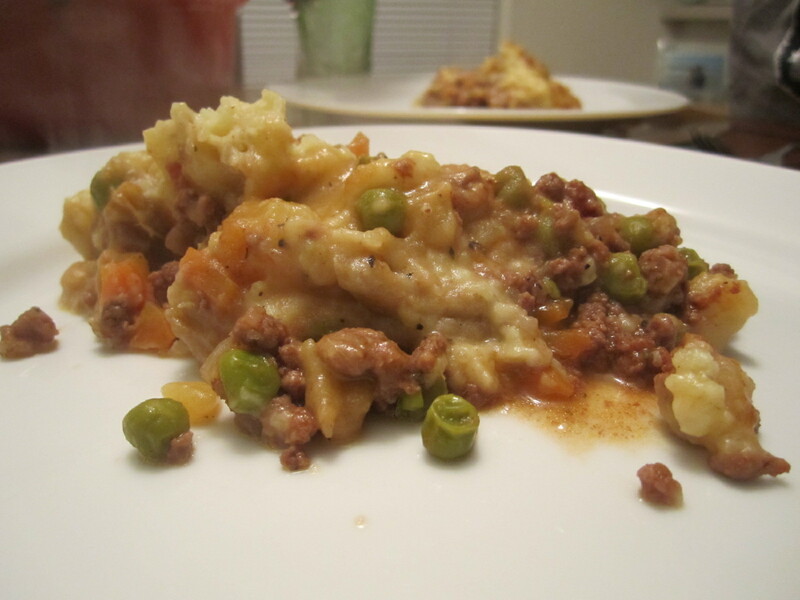 During the meal, Rob recalled his days at the academy when he would eat multiple plate-fulls of Shepherd’s Pie, and I made a playful-squeamish face while piling that second helping onto my own plate. We just-breathed, and just-ate, and just-had-a-good-time. That is until Sig tried to jump up on the table again and drink our wine. Ladies, make this for your men (just make sure you smell like a girl when you do)! 3 tbsp unsalted butter, plus 1 tsp more for topping. First, make the mashed potatoes: using a hand-mixer, beat the cooked potatoes, mascarpone cheese, milk, and butter together until desired creaminess (I prefer a bit more lumpy mashed potatoes, for texture). Season with paprika, s&p to taste. Set aside. 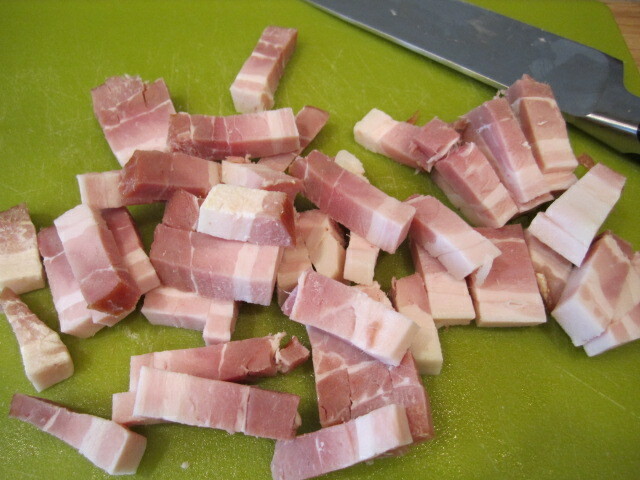 Then, in a small (2 qt) dutch oven or pot, brown the bacon until crispy over medium/high heat. 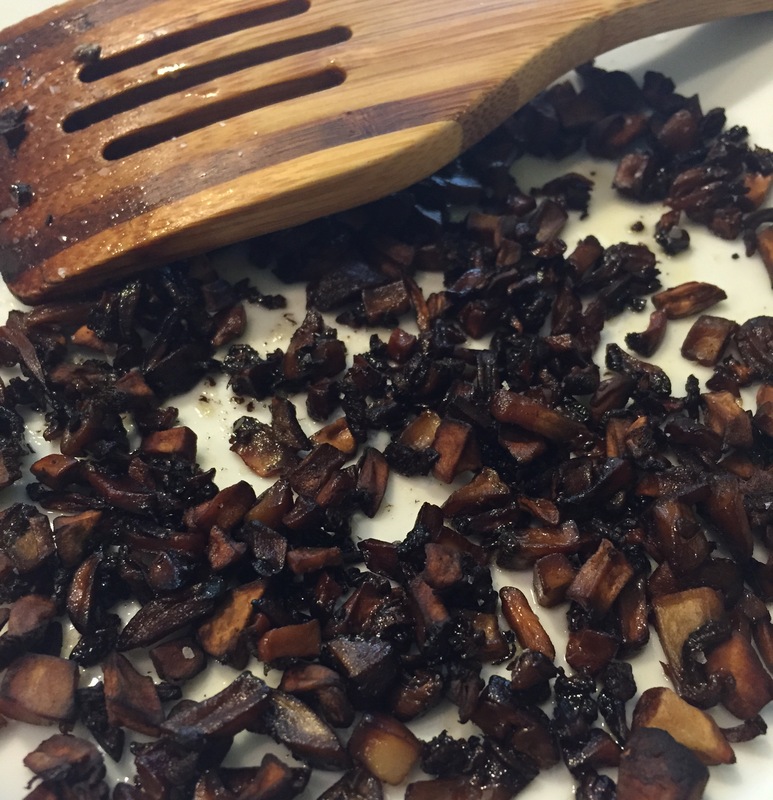 Remove from pot, and place on paper towel. Sauté the onions in the bacon fat until they start to soften. Lightly season. Add the carrots, sauté for about 5 minutes, then add the garlic. Lightly season. Sauté until the garlic just starts to become fragrant. Add in the peas, and the ground meat. Lightly start to brown the meat in the pot (it doesn’t have to be completely browned because it will finish cooking in the oven). Finally, add in the thyme, the cooked bacon, the tomato paste, and chicken stock. At this point, taste the mixture for seasoning – will probably need s, and especially p.
Top the pot with the mashed potatoes. Try to make it fairly even, but it doesn’t have to be smooth (actually, having peaks and valleys of potatoes browns beautifully in the oven). Dab the last tsp of butter in pieces on the top of the potatoes. Place pot on a sheet tray (some liquid may boil over) in the oven. Bake for about 45-50 minutes, until top is golden and crisp. Let set and cool for a few minutes before serving. The liquid cooks down and becomes a lovely gravy for the meal… try to get a bite of everything on one fork! Last week was a bit of a soup sandwich (have you ever tried to sake a sandwich out of soup? It doesn’t work). I feel exhausted just thinking about writing and reliving it all, but everything came to a relaxing halt with Sunday night’s Superbowl (Yay, Packers!) and Baked Potato Soup. As mentioned in a earlier post, I have new math groups, one of which is testing my classroom management strategies. On Thursday, after a long day at work, I needed comfort – FOOD comfort. 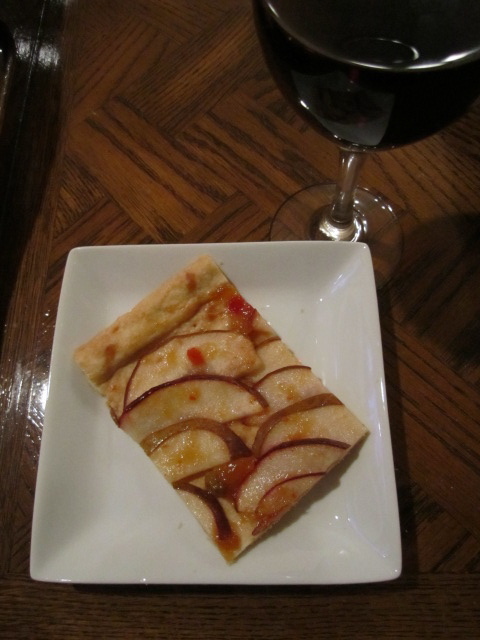 That night called for classic French flavors and technique – Braised Lamb Shoulder with Sweet Pommes Anna and a Pear Chutney Tart (my favorite part about that tart is the dough – a thin shortbread cookie-like sheet rustically formed to perfectly hold sweet and spicy pears. It was hard not to just eat the raw ball of dough). Saturday provided a different type of stress: a test! In order to keep my Oregon credential, I have to take, and pass, a few tests to ensure I’m qualified to teach in the state. Saturday’s test was the ESOL (English Speakers of Other Languages), and I think I did well on it. But, now it’s the waiting game to find out exactly how I did. The test wasn’t all that inconvenient because it gave us an excuse to go to Trader Joes (the test site was on the U of O’s campus in Eugene) and we were able to spend the night in Florence, a quaint, beautiful little town on the Siuslaw River. It might have been the fact that we slept with the back door cracked a bit, or that I woke up with my mouth open, or the stress of the week finally catching up to me (OR a very likely combo of the three), but I woke Sunday morning with a terrible sore throat. This was like the kind I used to get back in high school and college which would inevitably lead to strep throat. So, the last thing I wanted to do was cook. But it was Superbowl Sunday! And the Packers were playing!! Cheeseheads unite!! Even though Rob had to go on duty, I couldn’t watch the Superbowl without eating something sports bar-ish. I racked my brain; not having much of an appetite, I really only wanted soup. But already lounging in sweatpants by the fire, I did not want to go to the store. What to do? What to make? BLOG to the rescue! (That would be an interesting superhero – like a giant techie nerd with super-human typing skills and Dreamweaver web design capabilities not even the Trojan virus could defeat.) Thinking about my blog, I went back my source of inspiration: the potato. Combine with my craving/limited appetite for soup, and the biggest football game of the year only minutes away from starting, I remembered a classic: Baked Potato Soup. In this soup, I use limited cream and comparably minimal cheese, making it light and mostly guilt-free. I only par-bake the potatoes (to keep their integrity as much as possible), and use veg stock rather than chicken to enhance the vegetably taste of the potatoes. And having the underlying foundational taste of bacon fat really hits home the feeling of genuine pub food. Sitting back with my soup, I watched Green Bay spank the Steelers, laughed at the great commercials, cringed at the bad ones, and fell asleep in front of the fire, warmed from the inside out. I still have my sore throat this morning, so it’s a good thing I made enough soup to feed an army – I’ll need the leftovers! 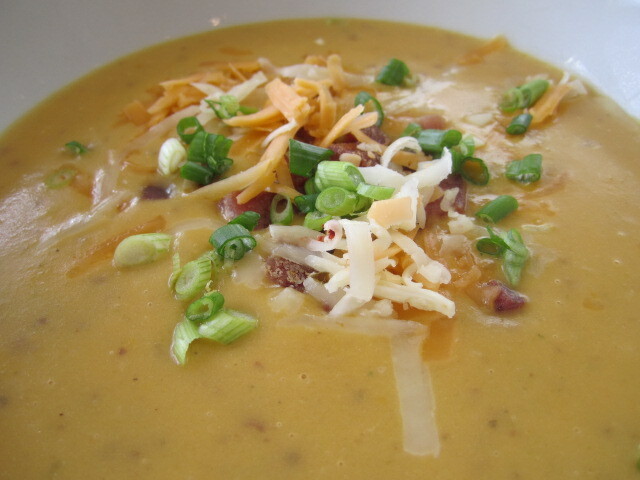 Garnish: shredded pepper jack and cheddar cheese, crispy bacon, and sliced scallions. Preheat oven to 375 degrees. Bake diced potatoes for about 15 minutes, until soft on the outside but still firm on the inside. Meanwhile, crisp up the bacon in a large pot over med-high heat. Once very crisp, remove from pot and put on towel to reserve for garnish. Keeping about 2 tbsp of the bacon fat, saute the onions, celery, and garlic in the pot. Make sure all veg is coated in fat, and saute until just starting to soften. 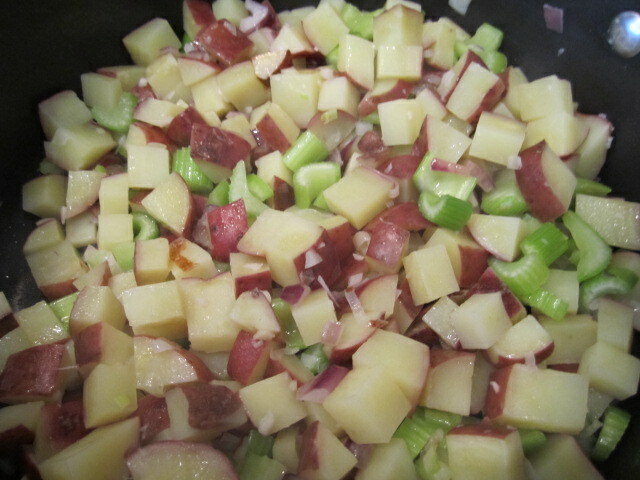 Add the diced potatoes, season, and saute in the pan for about 5-7 minutes. I even let the surface of the potatoes start to brown. Add the thyme leaves, veg stock, water, and Half & Half. Bring to a boil. Using an immersion blender or a stand blender, puree the soup until smooth. 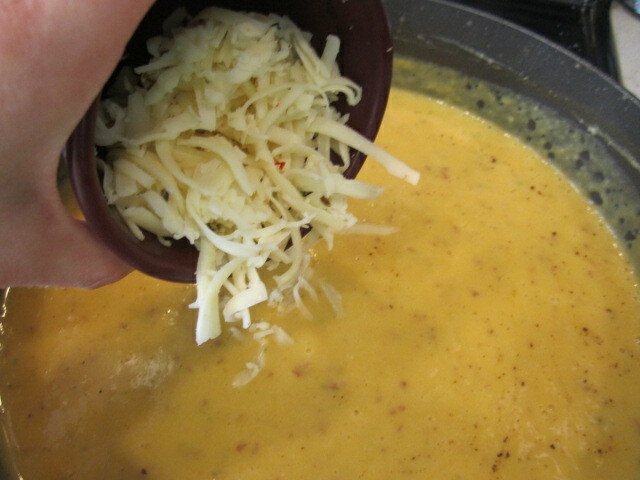 Keep on a simmer, and slowly stir in the two cheeses to melt and incorporate. Let simmer for about 5-10 minutes, and taste for seasoning. 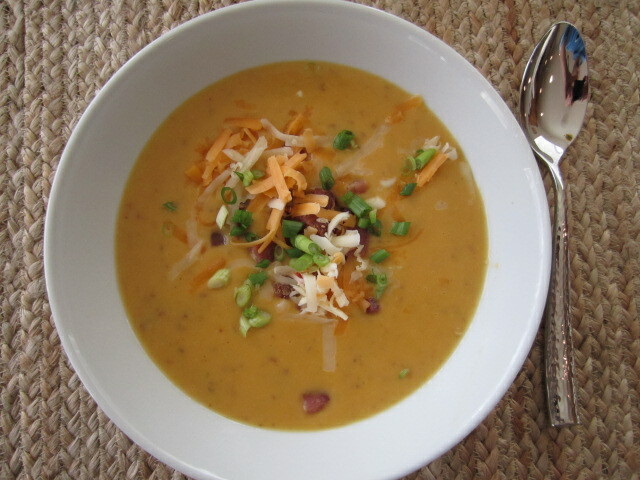 Serve in a shallow bowl, topping with the bacon pieces, shredded cheeses, and scallions.